What would it be like to live in Sabah, Malaysia? by Dave from The Longest Way Home ~ December 19th, 2011. Updated on April 9th, 2012. Published in: Travel blog » How to live overseas » Sabah (Malaysian Borneo). Move to or live in Sabah, Malaysia? I previously wrote about what would it be like to live in Malaysia? A controversial post in many people’s eyes if you read the comments. And to others, it simply offers up some home truths. I won’t repeat a lot of what I wrote there, my views nor opinions haven’t changed. I wasn’t even going to write this entry as Sabah, is a part of Malaysia too. But, the truth is, although it is one of the 13 states that make up Malaysia, it is a very different place to Peninsular Malaysia. Indeed, so is Sarawak, Malaysia’s largest state. So, in that regard, I do feel strongly enough to treat it as a separate entity when it comes to finding a place to live. A former British colony, occupied by the Japanese during World War 2, on August 31st 1963 Sabah became independent. Then, from a prior vote, on September 16th Sabah joined Malaya, Sarawak and Singapore to form the Independent Federation of Malaysia. Sabah then became a part of the formation of Malaysia in 1963 along with Sarawak. Today Sabah is not without controversy. The Philippines claims a large part of Sabah as its own. This stems from when the Sultanate of Sulu was given the territory for helping the Sultan of Brunei. Sabah was then leased from the Sultanate in return for arms to protect them from Spanish invaders. As of 2004 the Malaysian government was still paying the descendants of Sultanate of Sulu rent for the region. Today the region is still officially declared by The Philippines as theirs. However, it has been designated a current “non-issue” in the interest of improving relations and security with the government of Malaysia. This doesn’t stop the waves of Filipinos, both illegally, and those seeking asylum from the conflict zone of Mindanao (southern Philippines), arriving every year to live in Sabah. What’s Sabah, Borneo really like? After reading that brief history of Sabah you might think that the whole place was a bit of mess. But nothing could be further from the truth. In terms of day-to-day living there it’s very peaceful. 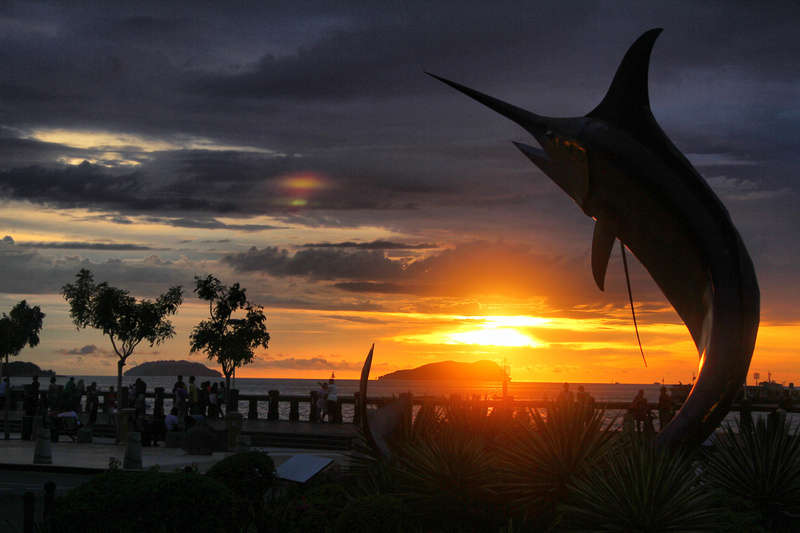 Indeed, the capital of Sabah, Kota Kinabalu, is one of the quietest and well-kept cities in all Malaysia. In fact, let me go out on a limb here and say Kota Kinabalu is one of the nicest capital cities in all South East Asia. The rest of Sabah is quite mountainous with a huge coastline where three-quarters of the population live. Sabah is of course famous for its national parks, wildlife reserves, and pristine jungle. It seems Sabah has something for everyone! What are the people of Sabah like? Malaysian’s or Sabahans? Most of the people I spoke to in Sabah, were happy with both terms. But, were adamant that they were from Sabah, and not just “Malaysia”. Whilst over on Peninsular Malaysia people called them Malaysian’s from Sabah. For the remainder of this article I’ll refer to people from this region as Sabahans. I found Sabahans to be incredibly friendly to the point in noticing a serious difference between them, and the other regions of Malaysia. People here are more interested in you as a person I found. While in other regions the typical tourist / foreigner dollar approach was more prevalent. I’ve had less “Where are you from” type conversations here, and far more “What do you like?” conversations. Yes, Sabahans seem to take more of an interest in you as a person, rather than you as a stereotype. And to me, that is a very rare trait to find today, anywhere in the world. Most of Sabah’s population is mainly made up of indigenous people from the region, with a huge 25% of the population being Filipino/Indonesian. From personal observations I note Chinese store fronts and restaurants are common place in Kota Kinabalu whilst Indian ones are not. This becomes even more evident as you travel further out from the capital. Quite a different experience to mainland Malaysia. Conversations I’ve had with Sabahans have, for a large part, always been pleasant unbiased and informative. I always got the feeling of worldly education amongst many Sabahans. They seem to be up to date with many international events, and happy to converse about them. That’s not to say there are no issues here. Economics plays a role here, and a percentage of the population have grown up without completing formal schooling. But still, the trait of Sabahan friendliness and want of learning remains. If you’re a regular reader here, you’ll know I think Sabahan food is fantastic. Fresh seafood is the highlight, along with tangy not to spicy hot sauces. 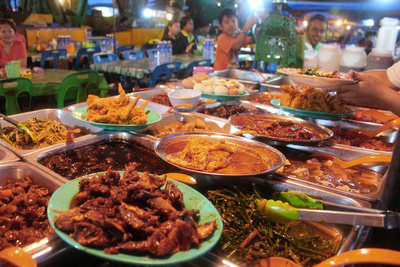 I won’t say what region of Malaysia has the best food, the result is being saved for a dedicated post. But, the variety, freshness, and flavorsome dishes in Sabah certainly ranks up there with some of the best places in the world to eat. Not good! Well, having just written that I can’t really think of many places in the world in 2011 where job prospects are actually good. Sabah is actually the poorest of all the Malaysian states, yet the cost of living is higher than that of west Malaysia. The poverty level here is around 16% (2007), which is an improvement to 22% in 2004. 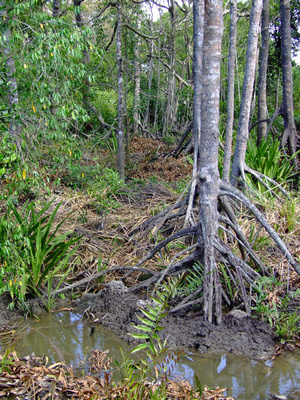 Most of Sabah’s income comes from its natural resources. 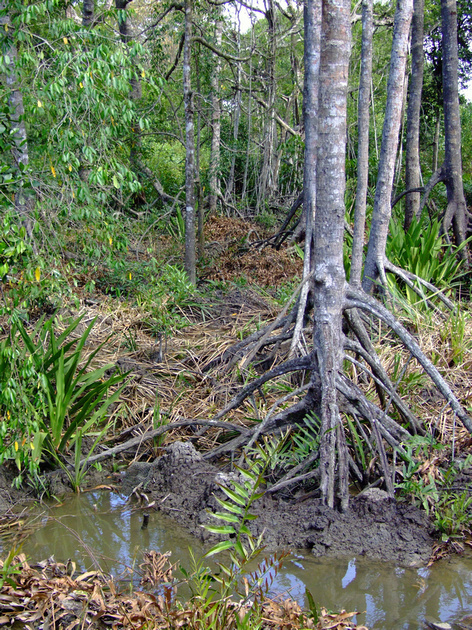 Timber, rubber and cacao being the most profitable. The second biggest income source is tourism, followed by exports of seafood. Couple all that with an estimated 500,000 illegal workers from The Philippines, Indonesia, China and Timor; and job prospects are not the best here. Most of the foreigners I’ve met in Sabah were working for large multinational companies. Oil, lumber and palm oil being the primary industries. There are several other expats who’ve settled here working in cottage industries and small businesses set up with their spouses. There are also a surprising number of foreigners working here in the tourism field. Mainly, again, from overseas companies offering jungle excursions, wilderness training and package school trips. Whilst not impossible, to find work here as a foreigner, seems to primarily involve getting a job from ones home country before relocating. Or, to have enough capital to open your own business here. This, is surprisingly uncomplicated depending on your requirements. 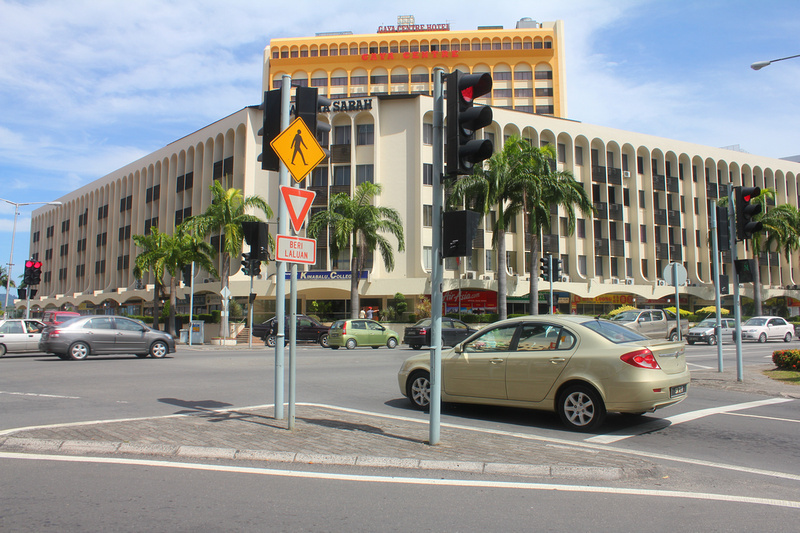 Rentals in Kota Kinabalu are relatively easy to find, affordable, and well maintained. Of course this all depends on your lifestyle and needs. Holiday homes and the like can be extremely expensive here, but for longer term leases things can be a lot less. My advice, if you are looking, is to do your searching on the ground here rather than online. Outside Kota Kinabalu accommodation becomes a little more basic, but again, pay a little more, and you can get some newly developed housing. For permanent relocation to Sabah, and if you have the capital, you should really do some reading up on Malaysia’s “My Second Home Programme” (official website). Car rental is easy, though a little pricey. Buying a vehicle for long-term stays might make more sense. Though, if living or working in a city like Kota Kinabalu it might be a better option to use public transport. It’s cheap, clean and efficient. Purchasing a small scooter is also another option. That said, Sabah can get very hot, and heavy rain might require something more personal to get around. 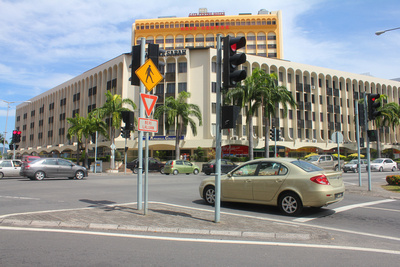 Outside of Kota Kinabalu the roads are reasonably well maintained, while congestion and road traffic incidents are quite low compared to West Malaysia. This one is always hard as it’s dependent on the person. I struggled hard with this in The Philippines, and was very surprised to see how my hard work paid off in Sabah. What I learned previously was very much applicable here. With some regional, cultural exceptions of course. Sabahans can be shy, but once you find a common ground the conversation will open up. Personally, I often wondered if Sabah’s colonial past and British education system plays a part here.Though, I don’t think that would ever be a popular statement to publicly make. It certainly would be in West Malaysia. I did however find a lot more common ground with Sabahans in terms of conversation than I have in many other parts of the world. Expats themselves here have their own little groups, but by in-large I found them coping well independently. A refreshing change from the many mini support networks I’ve found in other countries. There are of course little sticking points in all this, with religion and cultural necessities often putting pressure on people from all sides. So, what would it be like to live in Sabah Malaysia? I’d already traveled Sabah and left when illness brought me back for a longer stay than I thought. In turn I learned a lot about the place, the people and daily life. I can’t answer what would it be like to live in Sabah for you. I believe only you as an individual can answer that. I can however tell of my experiences and whether or not I could live in Sabah Malaysia. The answer is yes I could live here. I really do like the place, the people and the way of life in Sabah. The first relates to my original article on what would it be like to live in Malaysia. I don’t get the smoldering ticking time bomb feeling of race issues here. Though it’s never far away. The issue for me is that Sabah is a part of Malaysia, and there are serious issues there. Maybe it’s just that little bit detached from west Malaysia to not have as big an impact. But then again, maybe the spill over is not so far away either. The second issue is more related to me than to Sabah. I found it near impossible to get a job here. Simple as that. Finally there’s a whole host of little things that mount up, but nothing that ultimately can’t be sacrificed nor dealt with. If one really wants to live somewhere, then you really need to get a grasp on that idealism. “Take the jump”, is something I’ve heard myself repeating in my mind several times. Take the plunge and embrace Sabah for all your worth. Noble qualities. There never will be a perfect place to live, life is not designed like that. The smoldering pyre that is Malaysia’s race issue is my leading concern. I’m also here due to an illness that I’m just recovering from. It’s taken a lot out of me. For now, I simply need to move on from the stigma of being sick for so long. And, in the process envelop the feeling of being healthy once more. That to me is my new priority. And, so I move on. 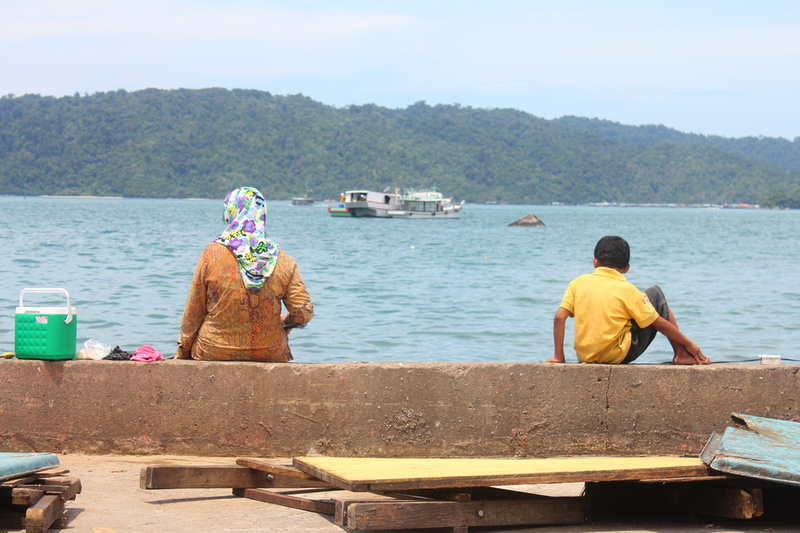 Very happy to have discovered Sabah, its people, and lifestyle. It might not be right for me to live in Sabah, just yet. But, it could really make a wonderful place to live for many other people. this is a very wonderful article to read. I am sure Sabahan will be so proud to read this too. I’ll certainly come back, might not need my current woolly hat though! While I have enjoyed your posts on Sabah, I’m glad to hear you are feeling better and look forward to seeing where you head next. Thanks Kristina, appreciate it. Going to test things out over the next couple of weeks. Website will be on auto pilot for a while! great post and it more or less agrees with my observations. while my experiences in west malaysia were also great, sabah with its sabahans is very special. I fear religion and not ethnicity may be the problem of the future, but both topics are linked. the danger is much bigger in indonesia though and I’m optimistic the 1Malaysia concept will prevail. Glad you found similar experiences over there. It’s always strange, yet obvious, to visit a nation that’s so very different in each major region. I also have hope for Malaysia as a whole. But the whole world as a whole right now is coming through some major changes. thank you for the post about our Sabah Dave. Great article Dave. A little more in-depth than usual? In 2012, I plan in seeing Sabah. Thanks for the insight. Hey Nathan, I’m trying to round out every country with an in-depth feature like this. Mainland Malaysia’s feature article stirred people up a lot “What would it be like to live in Malaysia” so I guess this is just a rebuttal to some of the conflicting people out there to say not all of Malaysia is the same! I really enjoy it when you do articles like this. In depth, analytical, and personal. But you also leave room for others to contribute. I’ve read both, and would also prefer Sabah. It seems closer to nature there and not so overwhelming. So curious about your next destination. Brunei? Looking forward to it. No not Brunei :) I’m trying to add something like this for every country I’ve spent some time in. There’s a big difference from passing through, and staying a while. I’ve enjoyed your writing throughout your time in Sabah Dave. I do agree with many points you’ve raised above in relation to the friendliness of it’s people and it’s great choice in quality food. These are both points that I picked up on during my short visit a couple of years back. I understand your frustration mate, in trying to find decent employment on your search for that place called home. I have many friends who have made their way around the world in search of something similar, but many can just not settle unless they are 1. happy with their environment, and 2. making a decent income to support themselves. It’s always one or the other, but seldom both…..
Good luck on your next port of call mate, and I’m curious as to where that may be? Hey Jason, yea there are a lot of catch 22’s out there. Like most things in life, you sometimes have to take a 60/40 percentage and make do with it. It’s that act of weighing things up that’s hard. Especially when in travel the grass is always greener, and only one border away. Work for someone who’s a non-national is difficult to find anywhere in the world it seems. Real work that is and not volunteering or the like. You leave us with the great blessing of kind true words. We are not perfect, we should strive to be better than what we are today. My hope is our economy will improve and you will find the time to return to a home. Stay strong, be wise, continue with you what you brought here. May your journey be a fruitful one. You are doing the work of many. Thanks for the kind words Anwar and in taking the time to send them. It’s appreciated. A very interesting read. I’ve bookmarked it to show my wife. We are looking for a seasonal retirement house in a place that’s not filled with golfers. Any idea how easy it is to fly in and out? Borneo always sounds so remote. Hi Charles, welcome. Yes, Kota Kinabalu is very easy to fly in and out of. It’s linked with Air Asia to mainland Malaysia which is a huge international hub. Getting in and out with an international transfer, and depending on your flights, can all be done in a day, usually. Interesting read for many people thinking how easy it is to just get up and move somewhere new. I’ve only done it myself via work which as you rightly pointed out takes away a lot of the problems. I truly agree with what you have wrote here. im from west malaysia and stayed in Sabah (KK)for a about 3 months for a community based research. People are friendly, less stereotyping, less ethno-centric. the people are nice to be around with, except for the immigrants which i find less appealing for me and Sabah is trying hard to cope with. Tourism is great, rich with culture and authentic!! Get to their local markets, and find those local jungle produces. Organic produces are cheap there. Nature is with you despite the hot weather. I definitely promote Sabah and Sarawak to everyone. I myself thinking of relocating to Sabah or Sarawak! Malaysia was formed in 1963, not 1966. Correct, I’d written 1963 earlier on in that paragraph the latter was a typo. Thank you for pointing it out I’ve not corrected it. Sabah is a wonderful place and its people are beautiful. You are right in that there isn’t the “ticking time bomb” feeling that you get in Peninsular Malaya. But there are a lot of hard feelings vis a vis the illegal immigrant situation. The fact that Sabah is both the richest state in terms of natural resources and yet the poorest state in terms of percentage of people in poverty is quite dismaying. It points to the corruption and mismanagement so endemic in the government. Nothing that you can do about it though. I don’t know if you will return to Sabah or even to Borneo but I hope it will be under better and healthier circumstances. This was an interesting read. You’ve caught on most of the way Sabahans live their lives. You’re right on the racism aspect of Sabahans. (I read your post on living in West Malaysia). We don’t dwell so much on what race you are and what religion you practice. Like me, I am of Chinese, Indian, Bajau, Dusun and Indonesian ancestry. So how can I conform to any kind of racism? Anyway, I am happy you liked Sabah! I hope you would come back and explore more. There is more to Sabah than just Kota Kinabalu. :) And as for the food, yes its grand! If I could suggest a place for you to visit the next time it would be a seafood restaurant called Salut if you haven’t already. It’s famous for its seafood.You should try it! :) As for places, Danum Valley and Maliau Basin are awesome travel destinations but do keep in mind that they are pricey. Anyway, I hope you are well and you will find what you are looking for from your travels! Happy travels. I found Sabah to be safe; the people approachable; the weather much too hot (except high in the mountains). I found that people have “dirty habits”, meaning that they will drop litter anywhere, leaving public spaces dirty. Some people are less than courteous in public encounters (they will cut in front of you in a queue, either in automobile traffic, waiting at the post office, or at a supermarket checkout). Some public facilities are not kept in good repair; or were poorly implemented in the first place. One example of this is landslides across mountain roads. Another example is the lack of ditches beside roads in the lowlands, with the result that they flood, leaving a dusty patch when they dry. Maybe my problem is a “developed country” point of view. BTW, I have been to Sabah several times.